Encounter amazing marine life at the aquarium snorkelling site. This was by far the best part of our honeymoon trip to Bora Bora...and that speaks volumes!!! Nick and Tony were incredible! I have been on several catamaran day cruises and this was by far the best. We had a blast! I highly recommend this to anyone visiting Bora Bora! This was a wonderful experience. Kiki and Matt were exceptional. Her knowledge of the area and her willingness to share with us made the trip even better. It was relaxing and enjoyable. The floating bar with champagne, fresh coconut, mango and chips while standing in beautiful turquoise waters and getting to know 3 other couples added to the experience. It was 4 hours of relaxation with the most beautiful scenery. I would recommend this excursion to anyone. I plan to go back and I will definitely do this sailing experience again!!! 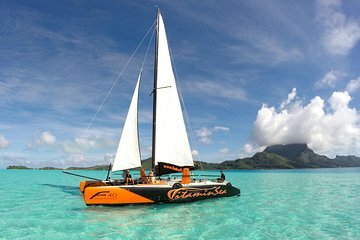 My husband and I took this tour while on our honeymoon in Bora Bora. It was absolutely one of the most wonderful excursions that we took during our honeymoon. We were picked up at our resort on Sofitel Private Island by a small boat and then taken to the St. Regis where we boarded the beautiful Catamaran. It was in tip top condition- we sailed around for hours laying in our extremely comfortable beds, enjoying the sights and music. We stopped and took a dip in the water, sipped champagne and lounged in the cool water. The staff were extremely friendly and knowledgeable, and overall it was an amazing way to spend our morning. Highly recommend! !